San Jose reconstructed the southern 0.5-mile end of El Camino Real with wide medians, pedestrian refuges, and sidewalk curb extensions in October 2014. On Tuesday, Menlo Park’s City Council postponed a pilot project to replace parallel car parking with buffered bike lanes on El Camino Real, deciding that neighboring Palo Alto and Atherton should also agree on a common design for bike lanes before proceeding with the permitting process required by Caltrans. Despite strong community support to fix the urban highway’s safety hazards, the city remains content with today’s configuration, after 11 public meetings held since April 2014 on the topic. In late 2014 Atherton approved a similar conversion of two of El Camino’s six lanes through the town into bike/ped paths physically separated from auto traffic. But Atherton’s Town Council put the critical next step to conduct a traffic study with Caltrans of the proposed six-to-four lane conversion on hold in February 2015–just four months after approving it. The Menlo Park Fire Protection District remains staunchly opposed to bike paths and bike lanes on El Camino Real, claiming they’ll threaten residents’ lives by slowing emergency vehicles. El Camino Real remains the most hazardous street on the San Francisco Peninsula, killing five and severely injuring 20 people in car crashes each year between 2005 and 2014, according to the Statewide Integrated Traffic Records System (SWITRS). A traffic safety report published by the San Mateo County Health System last month showed that 18 percent of all collisions involving pedestrians and bicyclists occur on El Camino Real, despite the street making up only one percent of total roadway miles in the county. Elected officials representing the two counties (Santa Clara and San Mateo) and the 19 cities along El Camino Real between San Francisco and San Jose have long decried the street’s traffic violence, but have taken little action to address it. In 2006 the region’s leaders adopted a shared vision to transform the 43-mile-long auto-centric street into “a multimodal boulevard safe and efficient for all users (pedestrians, bicycles, transit, and automobiles of all ages and abilities)” through the Grand Boulevard Initiative. But one decade later, the vast majority of the safety hazards built into the urban highway’s design remain. El Camino Real’s most dramatic improvements have taken place on its half-mile southern end in San Jose, where the city avoided Caltrans’s bureaucratic permitting process by convincing the state transportation agency to relinquish jurisdiction over the street in 2012. A $4.5 million reconstruction completed in October 2014 added crosswalks, curb extensions, pedestrian refuges, and a center median with trees. But no dedicated space for bicycling was added, as city planners opted to retain four travel lanes and parallel car parking on both sides of the street. South San Francisco plans to reconstruct a nearly one-mile section of El Camino Real between McLellan Drive and Chestnut Avenue with similar pedestrian improvements by early 2018, but like San Jose the city will prioritize auto traffic volumes and parking. Eight traffic lanes will remain at the intersections (six through lanes plus turning lanes), and even where sidewalk curb extensions are installed the crossing distances for pedestrians will remain over 100 feet. The proposed design is just as hazardous for bicycling, with only a striped shoulder between four and five feet wide provided, in some sections adjacent to parallel parked cars. South San Francisco hopes to reconstruct a 0.9-mile segment of El Camino Real with minor pedestrian safety improvements by early 2018. Image: City of South San Francisco. The South San Francisco project is one of four case studies pioneered by SamTrans to assist cities in San Mateo County overcome Caltrans’s cumbersome permitting process by providing a set of specific design exceptions to the agency’s Highway Design Manual. While these include narrower travel lanes (11 feet), curb extensions, and pedestrian refuges in wider medians with extensive landscaping including trees, narrowing the entire street by reducing the number of lanes wasn’t considered for any of the case studies. Daly City reconstructed a few blocks on the northern end of El Camino Real with some of the design elements described above in 2013, but also opted to retain parallel parking for cars rather than provide any dedicated space for bicycling. 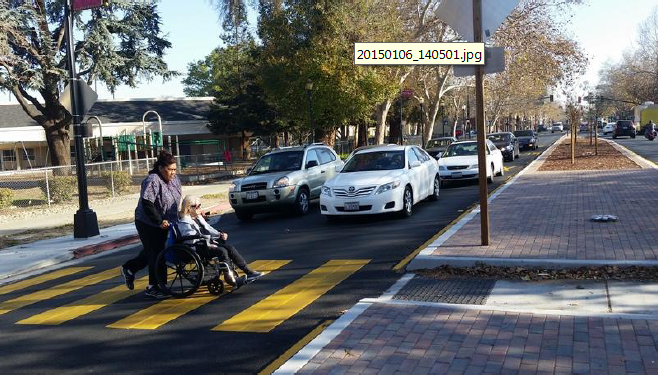 Sunnyvale installed bike lanes on a half-mile section of El Camino Real in January 2015, but made no pedestrian improvements. Up next? 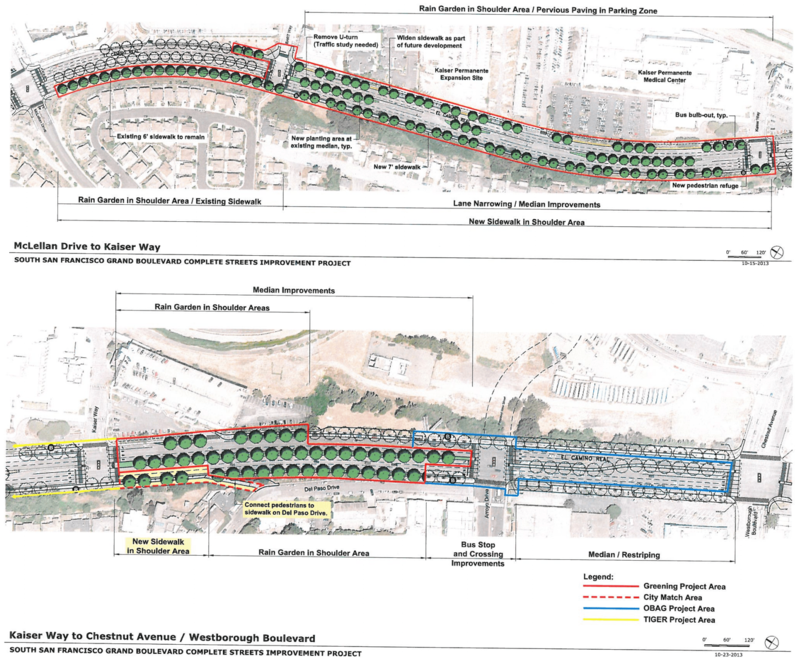 Redwood City’s El Camino Real Corridor Plan will consider redesigning the street later this year, but whether the city is the first to implement significant safety improvements on The Royal Road is far from certain. Parallel parking adds friction and slows traffic and removing it for bike lanes should speed traffic up, no? How do we hold someone at the Fire District accountable for lying to the public? It’s not just any “someone” at MPFPD who it seems can be relied upon to always weigh in against almost any bike/ped traffic-calming project … it’s always longtime fire chief Schapelhouman … who, sadly, ever since an off-duty fall from a ladder at his home, will never walk (or ride a bicycle) again. It is taking forever but ECR is incrementally becoming more accommodating to bicyclists. One segment at a time cities are claiming control and reverting it from its stroad status to become a proper city street. ECR had been the major route between SF and SJ for so long that people still believe that it is a regional arterial even though 101 and 280 overtook that role decades ago. Other cities should take San Jose’s lead and ask Caltrans to relinquish jurisdiction.